Odell Beckham Jr. – Greatest Catch in the History of Football? Home Headlines Odell Beckham Jr. – Greatest Catch in the History of Football? It's highly debatable if NY Giants rookie Wide Receiver Odell Beckham Jr. really had the greatest catch in the history of football. Considering the degree of difficulty to secure the one handed catch it's hard to disagree but if you factor in the pressure of the moment you may want to change your vote. I think before we crown the catch as the best ever we should compare it to other top catches in Giants team history. 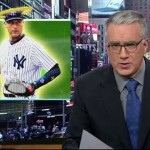 Home Headlines Poll: Derek Jeter Overrated?